People irrespective of age group love to enjoy the beauty of nature while floating on the water. Journey by boat was an invigorating way of enjoying holidays and getting refreshment. Time changes, so do the means. Nowadays, standup paddleboards are preferred over the old wooden boats. These inflatable sup boards have attractive features to be your confidante during the holidays, and your daily dose of refreshment after a long tiring day. There are lots of paddleboards out there on the market, but which one will fit your needs? The sup board gets the immense love of the people, but with a plethora of options, people become confused when they go for buying one. 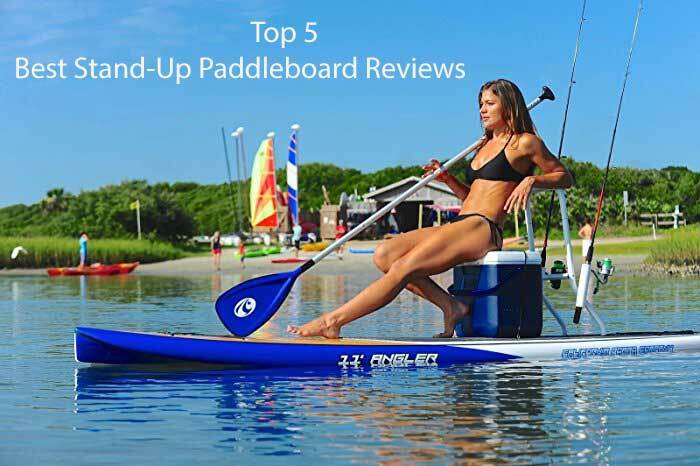 To assist you with that, we have researched and made a list of 5 best inflatable stand-up paddleboards models. We also prepared a buying guide which will help you along the way. Your product selection and buying decision will become easy when you know what makes a sup paddleboard good for riding. Here are the features that a good stand-up paddle board should have, and you should care about. Learn More about how to use standup paddleboard. Surfboard Surf paddleboards are typically shorter. These stand-up boards have narrower nose and tail. They are also sturdier than other paddleboards. Surf stand-up paddleboards are perfect for regular riders. Because of the narrow shape, these boards are more maneuverable on the wave. However, the tradeoff features of the surfboards are, they are slower, often less stable, and don’t track in a straight line on flat water condition. All-around BoardAll-around stand-up paddle boards are usually wider, thicker, and longer than the typical surfboards. These multi-purpose boards are a great choice for the beginners. All-around sup boards are spacious hence the rider get more stability. They also have decent glide and tracking for open ocean touring and flat-water paddling. Flatwater boards These sup boards are specially optimized for riding through the flat water, Open Ocean, and for downward riding. In general, they are longer than all-around stand-up paddle boards and often have a nose area. The side panels of the flat-water sup boards are usually rounded. This roundness helps to get more glide and speed. Most flat-water sup boards are wide and provide good stability for a novice. Racing boards Race boards are from the family of flat water boards but they are slightly narrower. The narrowness of the stand-up paddleboard increases speed. These boards might prove difficult for a beginner. 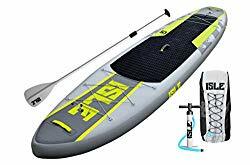 Performance, durability, and speed all these are major features of a stand-up paddleboard, and all these features significantly depend on the build quality of the sup board. And the build quality itself is measured by the construction materials and the rigidity. Materials Nowadays, military grade PVC materials are the best available materials for constructing stand-up paddle boards. These materials are very solid and durable. Almost all the leading manufacturers of sup board use these materials. Still, you will find variation in use of this PVC sheet, some of the manufacturer use 3-layers and some use single layer PVC sheet to construct the sup boards. Rigidity The rigidness of a sup board is an accumulated result of build materials and thickness. You will get maximum rigidity from a 6’’ thickness board that’s built with top-notch materials. From a good quality rigid sup board, you will get excellent balance and stability, which work best for a beginner rider. The body dimension of a sup board means the length of the board, the width of the board and the thickness of the board. Length: The length of the board is calculated from the tip of the nose to the tail end. When you decide about the length of your stand-up paddleboard remember that the longer is the board, the faster they are, and the shorter is the board, the more maneuverable they become. Generally, the length of the sup board is in between 8 to 12 feet inches. Width: Width is the most influential factor in the overall stability of a stand-up paddleboard. You will get more space for riding with your partner or doing other activities on a wide board. But, wider sup boards have less speed than a narrow board. In general, the width of the board varies between 26 to 33 inches. Thickness: You should also consider the thickness volume of the sup board while buying. For example, you choose two boards of the same length and width but different thickness, the thicker board will have more volume than the thinner board. And, the higher the volume, the more weight the sup board can carry. Fins add tracking and stability to the sup board. The fin navigation can be one of three types, one (center) fin navigation, 2 fins navigation, and 3 fins navigation. The larger fin with the wider base and longer front edge deliver more stability than a smaller fin. On the contrary, the smaller fin provides better maneuverability. Most of the fins are removable. You can swap, remove them all or change the navigation style of your stand-up paddleboard. Bungee cord area let you secure your food, clothes, backpack, and other necessary belongings. Most of the sup boards come with one bungee space; some have two bungee spaces. If the cord area is large you can store more things there. This bungee cord is mounted on the board with the help of D-rings, it may be 6 D-rings or even more. If you travel frequently or you have to cover a long distance to do stand-up paddle boarding, you should consider the weight of the deflated sup board. However, the backpack lets to carry the weight conveniently. Having leashing point in surfboard is a must, but for other boards, it just adds value for the user. Leashing point is used to stay connected with the board when you fall into the water. Manufactures generally mount an extra D-ring beside the air valve for ankle leashing. Traction pads are the rubber coated area of the stand-up paddle board. The pads help the riders to stand with firmness on the board both in dry and soaked conditions. It is also a comfortable zone for sitting, doing exercise, yoga on the board. The long and wider are traction pads the better for a rider. Most of the times gears come along with the sup board so you do not need to buy them separately. These gears include a pump, a backpack, a paddle, an ankle leash, and a repairing kite. Almost all the backpacks are good so you don’t need to pay extra attention to them. You should pay your attention to the paddle and the pump. Adjustable and floating paddles are best. You may occasionally sacrifice the floating nature but adjustability is a must. About the pump, see how much time it takes to inflate the sup board using the pump. If it isn’t fast enough for you, you can always go for an electric pump. 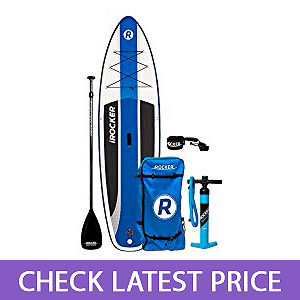 iRocker inflatable cruiser stand-up paddleboard was manufactured by a famous water sports items manufacturer ‘iRocker’. This sup board got riders’ attention ever since because of its design and performance. It delivers the best performance in any water condition without compromising the speed and balance. Because of the wide deck and newbie-friendly body dimension, this board is the best stand-up paddleboard for beginners till date. Triple layer PVC materials have been used to construct this iRocker sup board. These materials are the best available materials for constructing sup board on the market. You will gate the finest performance irrespective of water condition. The PVC sheets and 6-inches thickness give this board an excellent rigidity. Whether you are a beginner or professional, you will gate proper balance and stability on the board. The upper panel of the board is covered with a tri-colored branded EVA foam pad. It is placed to ensure good balancing, turning, standing, sitting, for the rider. IRocker features a bungee area and 4 additional stainless-steel D-rings. You can secure your things like the backpack, food, clothes etc. under this bungee area or can strap with the D-rings. iRocker sup features 3-fin navigation system, two small fins are on the right and left, and one large fin in the middle. The middle fin is removable. These fins help to ride with speed in the rough water condition. At the tail portion of this stand-up paddleboard, there is a high-quality air valve. This valve is used for inflation and deflation of the board. And, just beside the valve, there is an extra D-ring for the leashing. An elegant, high-quality iRocker Inflatable of the price. Solid build quality and excellent rigidity. Wide space for doing exercise and riding with dogs and kids. Best pick for this price range. slightly heavier with 25lbs weight. ISLE stand-up paddleboard was manufactured keeping durability and performance in mind. This sup board is made of high-quality materials and gives you good performance in various water conditions. 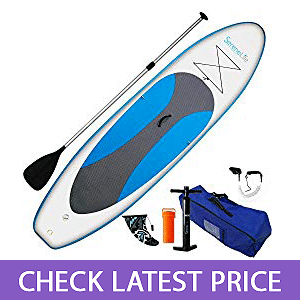 The board is lightweight, hence easy to carry to the bank of a river or with 11 feet length and 32 inches width, this board is probably the best stand-up paddleboard for fishing and yoga. Irrespective of skill level the board ensures the riding with comfort and joy. ISLE sup board’s body is made of PVC materials, which is a kind of durable military-grade sheet. As a result, your board will glide in any kind of water conditions with bothering you much. This board is designed with 2 bungee space and 4 extra D-rings. Under these bungee spaces, you can secure more things than a standard one bungee space board. With the additional rings, you can strap things as well as set up a seat. Balance and stability depend on the rigidity of the board. 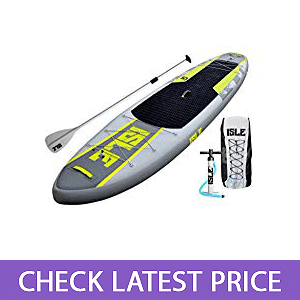 This ISLE 11′ Airtech paddle board has 6” rigid thickness which is able to deliver proper balance and firmness to the rider. ISLE sup has three fins navigation structure. These fins are removable. You can use the board with any combination of fin navigation structure. The sup board uses Halkey-Robert style air valve at the nose end. This valve is a high-quality air valve, which helps both to inflate and to restrict the air inside the board. Almost half of the upper sideboard is coated with diamond groove traction foot pad. The pad has a substantial grip and you will be glued to the board during the ride. An elegant, high-quality ISLE 11 Airtech Inflatable Explorer of the price. This stand-up paddleboard is durable and very strong. Dual cargo system allows great space. Padded handle in the middle. A handy and compact backpack. When loaded, it may feel a little lethargic. 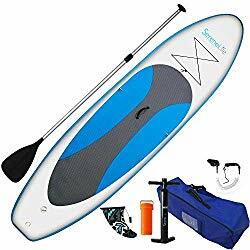 The SereneLife sup board is one of the best portable stand-up paddle boards for a woman or a man, meaning it is a great choice for very personal use. It’s an individual sized board with only 19lbs weight! 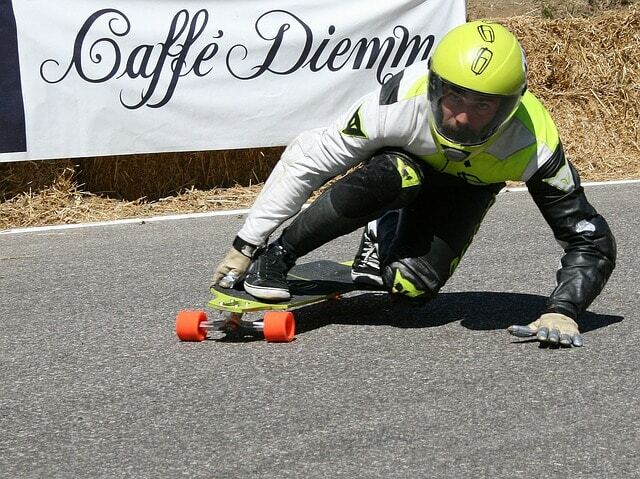 Because of good construction and rigidity, the board can deliver great performance to the rider. This SereneLife sup board is also a winning deal one considering the price. 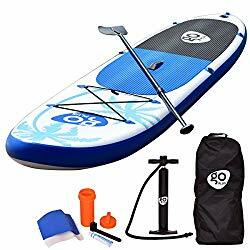 You can travel frequently carrying this lightweight board on your back and can do exciting things other than just riding, such as exercise, fishing, yoga. The entire cruiser paddle board is fabricated with reinforced engineered PVC materials. These materials are durable and will safeguard your board from ding or damage by dropping or hitting. With 6’’ thickness the board gives you solid rigidity during the ride in both flat and wave water. This rigid construction especially facilitates the beginners for more balance. More than half of the surface of SereneLife Inflatable board is wrapped with a non-slip deck pad. As the feet stay firm, keeping balance, moving forward, and turning become easier on this deck pad. The board includes a bungee cord space and 5 additional D-ring. The bungee area is used to store the belongings. Additional D-rings are used to strap things and ankle. The three-fin tracking system will improve your overall speed, steering, and maneuverability. The center fin is removable. You can attach and detach the center fin without using any tool. The manufacturer used a premium quality air valve at the tail end of the sup board. It’s a Halkey-Roberts air valve, which is used especially because of its air containing capability. An elegant, high-quality SereneLife Inflatable of the price. Standard sup board for personal riding. 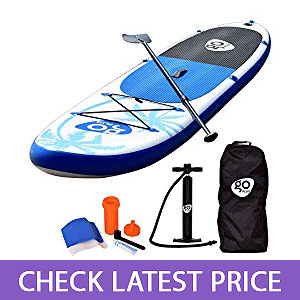 Cheap standup paddleboard with decent quality. Not for two persons, especially adults. This isle sup board is a mid-sized inflatable paddle board. The board will give you above-average performance in various water environments. Design and build quality of isle sup are solid and can carry more than one person at once. If you want speed, we won’t recommend it. If you want stability and space, heck yeah! It provides a good balance to the rider that’s why doing fishing, yoga, and riding become enjoyable on this board. Like iRocker, this sup board is also made of the highest quality PVC and drop-stitch material. This military grade material will protect the board during any kind of dropping, hitting with rock and stones. This ISLE stand-up paddleboard has more rigidity compared to the 4” thickness board. The board features 6” thickness that coated with PVC sheets. Therefore, a rider gets good balance and firmness on the water. ISLE sub cruise comes with 7D-rings arrangement, whereas 6 are fixed under the bungee area and other one placed beside the valve. Under this bungee, you can secure you necessary stuff, backpack, and food. About two-third area of the board’s surface is covered with an EVA rubber pad. The pad gives the user a strong grip on the board even in a soaked condition. The sup paddleboard features only one center fin. The fin has been attached to get better speed in junk water. The fin can be removed when you don’t need it. A high-quality air valve is fixed at the tail point of the board. The valve is strong enough to confine the air inside the board until you deflate it. 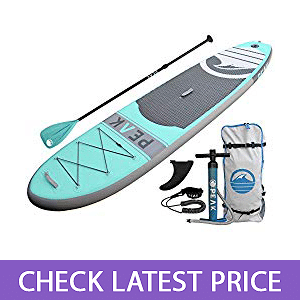 The all-around PEAK sup board comes with some truly satisfactory features for all type of users. Use it for yoga, exercise, nature watching, any way you see fit. 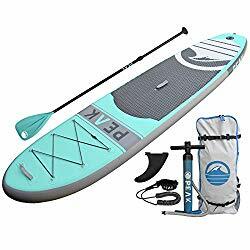 Details review of PEAK Inflatable Stand-up Paddle Board. An elegant, high-quality PEAK Inflatable of the price. Made of military-grade durable materials, lightweight. The best stand up paddle board for yoga, exercise. Comes with a strong and comfortable backpack. This board is made of single layer PVC sheet instead of 3 layers, which is justified by the cheap price. The aluminum paddle which weighs much than carbon fiber paddle. Not good for speedy riding. The Goplus Inflatable board is capable of running in any water condition. You will get good performance in the ocean, lakes, river, and other water environments. One fin navigation and solid rigidity will ensure your balance and stability in both waving and calm water. Having more free space on the board you can do more than just paddle-boarding on the board. It also goes easily with any skill level riders. This board brings a deal so good, we can safely say this is the best stand-up paddleboard for money. The Goplus paddle board is manufactured with the best materials available. It is wrapped with a military grade drop stitch sheet. This material is sturdy and gives the overall stand-up paddleboard steadfastness to fit all water conditions. As we said earlier rigidity is the combination of construction materials and thickness. Basing this statement, this Goplus sup is strong in both segments with top grade sheets and 6” thickness. Wavy ocean or calm water, go for anything without worrying. The standing area of this sup paddleboard is covered with Eva textured foam deck. This foam deck is a comfortable and secure place for controlling, standing and sitting. Heck, you can even have a nap if you want. Goplus stand-up paddleboard comes with one fin tracking system. This fin makes riding easy in the anomalous water. This fin is removable and you can install and remove it without using any tool. Goplus Inflatable 11′ Cruiser has one bungee cord is attached to 4 D-rings. It is a safe space for keeping baggage and foods. At the tail end, it also has a spare D-ring, which is for leashing the ankle. The board also has a decent air valve for inflation and deflation of air. This air valve is fixed at the tail end of the board. If you have a budget constraint, this board will be your solution of several seasons at a cheap price. An elegant, high-quality Goplus Inflatable of the price. Constructed with military grade materials. Good performer in all water environments. No extra D-rings for kayak set. At the first stage of buying, you need to enroll information on yourself and your needs. The two important things you have to be sure are your weight and skill. Your Weight: Different boards have different weight aptitude so measuring your weight will help you narrow the list. Moreover, if you want to ride with your partners, kids, dogs, and your friends, you should consider the weight of them too. Your Skill level: Some boards are beginner friendly, some are suitable for professionals, and some go with any skill level. That’s why decide what skill level you belong to. 2. Where do you do stand-up paddleboarding? Depending on the water atmosphere, stand-up paddle boards are different. Some boards are specially made for flat and calm water, others for the wave. So, you should go for the boards that are compatible with your respective water environment. 3. Why do you do stand-up paddleboarding? Everyone knows that paddleboarding is a great way of fun and travel, but other than just riding on the board, sometimes we also love to do other things such as yoga, exercise even sleeping on the sup board. For each specific type of activity, there is a special type of sup board. Some sup boards are good for fishing, some are for racing, some are for doing exercise and yoga, some are for traveling with family or kids or pet, and some are for surfing the wave. Ideally, you should decide first what you will do with your board, then move forward. After understanding all your needs, you can plan a budget line for your stand-up paddleboard. And, of course, set an upper and lower limit of your budget. This will save you time, hassle and keep you realistic. Now your next step is to go either an online shop or a physical shop. While visiting the shop, know about the warranty policies and their after-sale services. Also, check the additional gears that come with sup board. Sea, ocean, river, lake these are vast sources of refreshment. Walking along the sea beach, enjoying sunset seating on the beach sand, and passing time on the bank of a lake revive our heart and soul and make us jovial. But, when you have the best stand up paddle board you can enjoy the beauty of the sea, ocean, river, and lake even better. Your fishing, yoga, physical exercise will also be more satisfying. Moreover, paddleboarding with your kids on the weekend can make them delighted as well. You’ll grow a stronger bond with your family. SUP boards can give at least a few years outing arrangement at a cheap price. But before that, you have to make sure you are getting the product that goes with your particular needs. We hope our stand-up paddle board reviews will help you with that. Have a great outdoor experience in the coming season. Happy Paddleboarding!